With the betting world becoming more and more competitive every day with more new betting operators added to the online landscape nearly on daily basis, bookies needed to find a way to cut the queue and sit in the front row in order to attract and retain customers. One of the most common ways to do it is free bets. Whenever a punter opens a new betting account at a bookmaker’s, they are likely to be presented with a welcome bonus that traditionally comes in a form of a free bet. 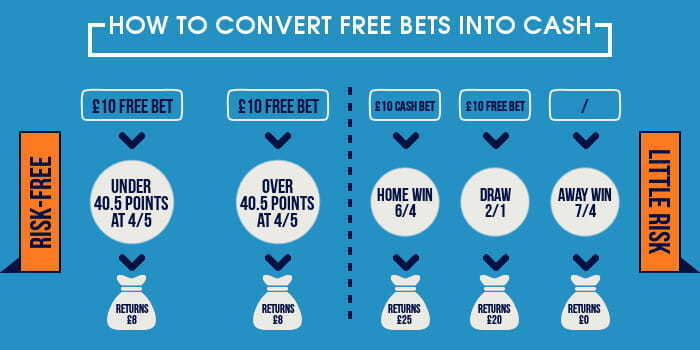 What separates good bookies from the best ones are the amount of the free bet and terms and conditions that are required to be met so that customers can claim their free money. Those amounts can vary from £5 up to £200 at Bet365 which still stands as the single highest welcome bonus in the entire online betting world. Widely recognized as arguably the most reputable name in the industry, Bet365 will match your first deposit 100% up to the aforementioned amount, which is an offer as good as it gets. It needs to be noted, however, that most of the bookies will not allow you to withdraw your bonus money until you’ve spent a certain amount, but fortunately there is a way to convert your free bets into cash. In order to illustrate how a free bet can be turned into cash, we will use a football match as an example, since football includes three variables. The more variables, the bigger risk but also the bigger returns. First thing you need to do is to find a value bet and a football game that will offer decent odds to work with. So let’s say you have a Home Win at 6/4, Draw set to 2/1 with a betting exchange and Away Win of 7/4 betting odds. In order to make most of your free bet, you will be required to invest some more of your own money. Therefore, we advise you to do it through a betting exchange where there is a greater chance your counter selection will yield result and help you get most out of your free bet. This way you have covered yourself and protected your investment given the fact you will be presented with an opportunity to earn more than you placed. Free bets on a three-way outcome involve risk, but pay better than two-way bets such as Over/Under goals or Both teams to Score selections. Do remember that you don’t receive any stake back on free bets, but with the aforementioned model spread between a bookie’s free bet and an exchange offer you will be able to get the most out of it albeit with a certain risk. But that’s why we’re all here for and a little adrenaline rush will do us no harm. One of the most obvious perks of online betting and a thing that punters love the most are all of the various free bets operators keep throwing our way to keep us stick with them and choose one over another. You have to understand them, it is a competitive betting world out there and everyone is doing their best to survive. Punters will not complain, however, as these little perquisites are more than welcome and beneficial – especially if you know how to use them to your own benefit. Let’s say you want to open a new betting account with a bookie. First of all, you are advised to choose a respectable name such as Betfair in example. Being one of the biggest names in the betting industry, Betfair will offer plenty of sweet stuff for its potential customer. Globally recognised for their world-leading betting exchange, Betfair offers a risk-free £10 bonus for new customers who open an account with betting exchange. At the same time, those who decide to register on the regular Betfair site will be rewarded with a £40 budget on a £20 deposit, which is another great way to get started with betting. When you decide to accept one of these offers and sing up with a bookmaker, you need to make sure to read terms and conditions as the majority of operators will simply miss a chance to withdraw your bonuses until you have invested the full amount at a certain number of times and at a set minimum odds. Luckily, there is a way to use your free bets in such way that will allow you to convert your free bets to cash and that is where aforementioned betting exchange comes into play. The first thing you will need to do – after opening an account both at Betfair regular site and betting exchange – is to place a bet, preferably on a competition you are familiar with, in our case the Premier League. With £20 bet you made with Betfair, there is £40 you can use to bet, which is an extra £20 from a 100% bonus. Liverpool at a 2.00 betting odds will see your potential win go to £80, making it a £60 profit which you probably won’t be able to withdraw however. Next step is to get over to the betting exchange and place the exact opposite bet you have previously made with the bookmaker in order to claim the profit. Having backed Liverpool to win with Betfair, you will now lay Liverpool at the exchange, which basically means you are betting against Reds to win. You will want to make the same amount liability, in this case, £40, and set it against Liverpool on 2.20 which results in you winning if Reds lose or play draw. If that happens, you will have no money left at Betfair account, but you will have £88 minus £20 + £40 = £28 profit at the exchange you can withdraw without issues. The second scenario predicts Liverpool winning and you losing your £40 staked at the exchange. Still, you will break even with £80 tally from the Betfair bet you can reinvest in the same pattern until your selection with betting exchange goes through or until Betfair allows you to withdraw your bet by meeting the wager requirements.